After students/children have listened to the story of the Prophet -sallallaahu alayhi wa salam- and the 1000 people who ate to their fill from the bread and soup of Jabir ibn Abdulllaah -radiallaahu anhu- that was blessed by the Prophet - sallallaahu alayhi wa salam-(an incident that occurred during the Battle of al-Khandaq) this theme pack can be used to supplement that lesson insha'Allaah. It can also be used for a fall/autumn theme as well. If you have questions about how to use any of the activities please leave a comment insha'Allaah. The hadith about the soup and bread of Jabir ibn Abdulllaah that fed 1000 people. Two piece puzzles for children to work on content words and colour word recognition/practice. 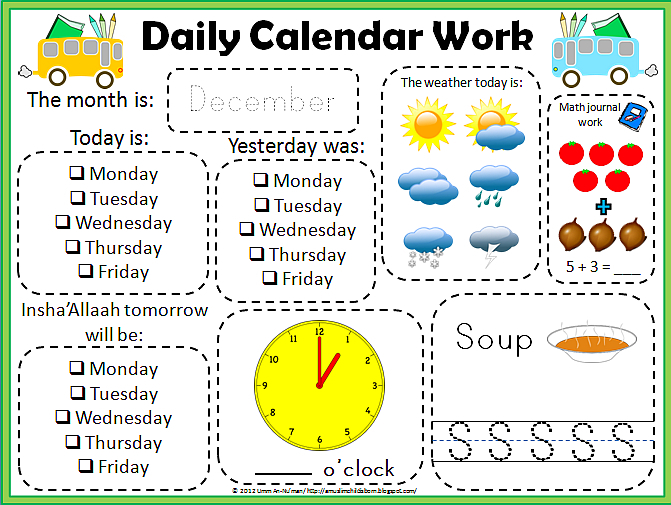 There is also a calendar notebook/notebook calendar for the month of December with this activity pack as well alhamdulillaah (downloaded separately from the Soup Theme Pack). 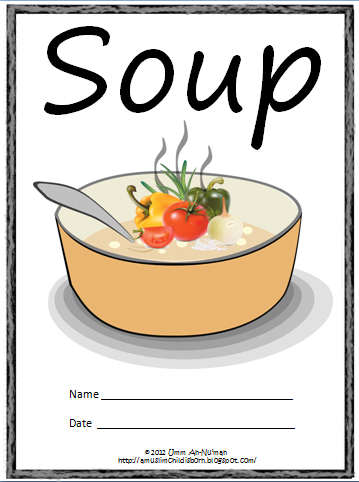 This calendar notebook is not specifically for this theme pack (and the Soup theme is not a month long theme) but it can be used during the month of December with the Soup theme pack insha'Allaah (as seen in the picture below). The calendar page in the file is different from the picture above in that it is more printer friendly and includes the days Saturday and Sunday. This is a first attempt and its format is primarily geared toward the preschoolers and kindergartners who are still in the pre-writing stage. It is also geared toward classroom use (but is not intended to replace the morning Circle Time - these pages can help reinforce what is learned during circle time). Teachers can put the cut out cards of the clocks in a basket (placed conveniently near the door where students enter the classroom) and each morning students pick up a clock card to paste onto their calendar page for that day insha'Allaah (the same applies for the math journal section and handwriting practice section). Also included in the file are cards for changing the math journal section and the handwriting practice section. Insha'Allaah, math journal and handwriting practice cards that you can edit will be uploaded shortly - please check back. I am printing this and I love this! I love that you also put instructions for printing on cardstock! It helps a lot! alhamdulillah! I have a question about the statement question section, how is that supposed to be used? The ones that have the words statement and question in the box, are they to be cut out and the bigger carrots cut out and to be used as teaching aids? And then the pots with statement and question to be used for kind of like a file folder game, with the smaller carrots? If yes, would those be printed on cardstock too then? Jazakillah khair. For the editable math journal and handwriting practice section, are we to fill/edit that by hand or digitally? Sorry, I'm a bit ignorant in this matter. The large carrots are used with the two cards that say "Statement" and "Question". Students sort them accordingly. The smaller carrots are used with the page that has the two posts - one saying "Statement" and the other says "Question". Again, students put the carrots (sentences) in the correct pot. You can present the activities as you like (i.e. if you'd like to make it a file folder game, interactive bulletin board, literacy centre activity, etc.). For the math and handwriting journals....the version that you can edit has not been uploaded yet. But it will be a file that you can type in what you'd like insha'Allaah.